`every heart imagines itself the first to thrill to a myriad sensations which once stirred the hearts of the earliest creatures and which will again stir the hearts of the last men and women to walk the earth' What is a life? How shall a storyteller conceive a life? What if art means pattern and life has none? How, then, can any story be true to life? These are some of the questions which inform the first of Maupassant's six novels, A Life (Une Vie) (1883) in which he sought to parody and expose the folly of romantic illusion. An unflinching presentation of a woman's life of failure and disappointments, where fulfillment and happiness might have been expected, A Life recounts Jeanne de Lamare's gradual lapse into a state of disillusion. With its intricate network of parallels and oppositions, IA Life reflects the influence of Flaubert in its attention to form and its coherent structure. 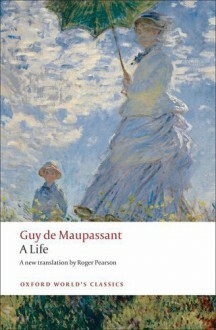 It also expresses Maupassant's characteristic naturalistic vision in which the satire of bourgeois manners, the representation of the aristocracy in pathological decline, the undermining of human individuality and ideals, and the study of deterioration and disintegration, all play a role. But above all Maupassant brings to his first novel the short story writer's genius for a focused tension between stasis and change, and A Life is one of his most compelling portraits of dispossession and powerlessness.About the Series: For over 100 years Oxford World's Classics has made available the broadest spectrum of literature from around the globe. Each affordable volume reflects Oxford's commitment to scholarship, providing the most accurate text plus a wealth of other valuable features, including expert introductions by leading authorities, voluminous notes to clarify the text, up-to-date bibliographies for further study, and much more.